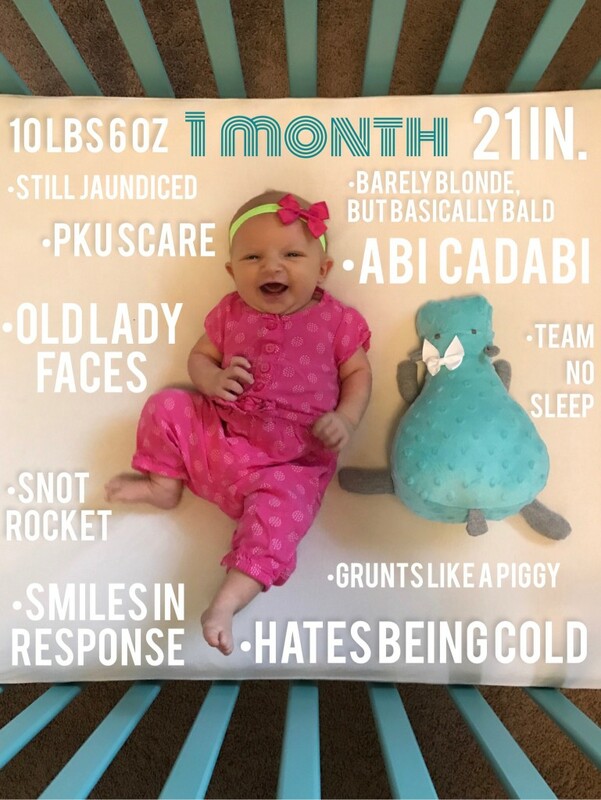 Baby Abi turned one month old this week! Usually these months fly by, but with everything Abi had going on in this first month it seems like she’s been around for much longer! I have been to more doctor’s appointments alone with all three kids this past month than I thought I would this whole year! But through it all, we have been super blessed to continue to receive positive news at every corner for Miss Abi. Officially no PKU and her latest test – the hepatic functions – came back mostly normal as well. It only showed elevated numbers in reflection of her lingering jaundice, but nothing more. We are still going to the hospital for bilirubin labs, but her levels are slowly but surely continuing to drop, so hopefully we won’t have to do those much longer either! When we were pregnant with Abi and people saw we already had feisty young twins, they would often say things like “Oh, the third child is always easy going and laid back, don’t you worry!”. After a month with Abi, I can confidently say that did not happen in our case, haha! We love her to pieces, but she has caused more of a stir in her first month than the twins did combined! 🙂 Much of it is not her fault with all these doctor appointments, of course, but she does have a bit of a fiery personality, too. I just think that’s to be expected with our kids, because we’re 3 for 3 so far! I guess us Kramps just don’t make laid back kids, and that’s okay. We will just continue to pray for the Lord to guide us in knowing how to love and train them well, so they use their strong wills and passionate personalities for God’s good purposes! She has a Cherish 0 to 100 scream and she turns bright red when she’s mad. She shoots boogies across the room when she sneezes, and she has adult sized toots! She has terrible gas pains that keep her up most of the night, and we’re lucky if she stretches a feeding 3 hours before she’s hungry again. She gained nearly 3 lbs in her first month and 1.5 inches. She loves being held, and she gets held pretty much all day! 🙂 It’s nice going from 2 babies to 1. Abi is way more spoiled than the twins were at this age. Matt and I are loving how easy it is to just have 1 baby to tend to, so we pretty much just cuddle her back and forth all the time. Abi is living up to her first impressions we received of her in the womb. Always stretching, kicking, trying to stand. She’s so strong and active! I kid you not, she’s rolled over from her belly to her back already! She did it twice today, at just 5 weeks old. As busy and scary as your first month was, little Abi, we wouldn’t trade it for the world! We all 4 love you so much, and we can’t imagine our lives without you now that you’re here! I can’t wait to see what the Lord has in store for your bright future!